← We have arrived in Basse! Banjul and the Atlantic Ocean are calling us! What a great day! 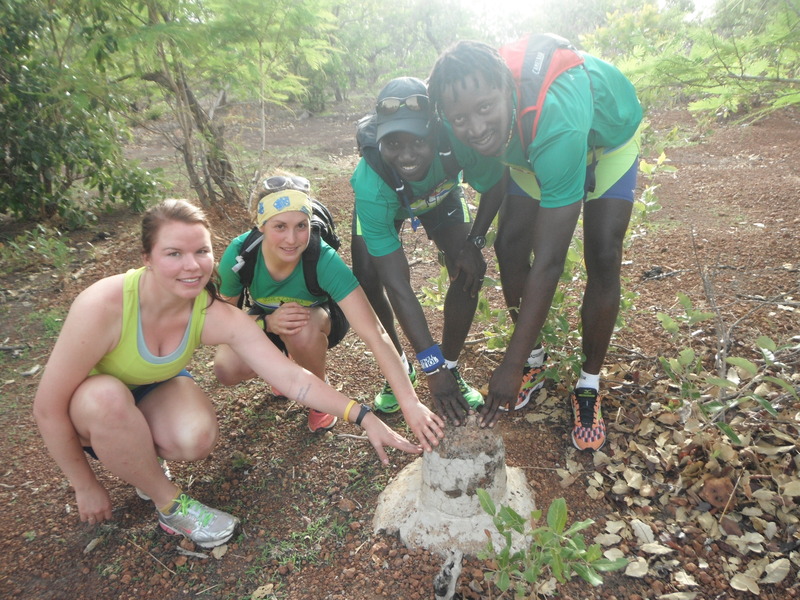 We have completed the first 26km of our journey across The Gambia! It was not as hard as I expected and not as easy as I expected, with some kilometers that went by quickly and some that dragged on. This morning, we work up at 5:05am to the sounds of the Muslim call to prayer – they were much louder than I ever could have expected. I had had a hard time falling and staying asleep last night on account of the heat (my sister ended up sleeping face down on the tile without a blanket or pillow to try to stay cool), so felt quite groggy, but at the same time the adrenaline was starting to kick in. My sister and I met up with the team at 6:00am – an early start because of the long drive from Basse to the border and the naïve thought that it will be slightly less hot at an earlier hour). Similar to yesterday, as we drove west, I kept thinking: Am I really going to run all this distance? Really? After a bumpy (as they call in Africa: “massage”) drive to the border down smaller and smaller dirt roads, we finally arrive to our starting point – a small concrete knob on the side of the path. (Luckily my team will be doing this for the third time this year, so they know where to go directly; unlike Erin’s run the first year where they had to search for a while to find the border)… So, we ate, packed, prepped, and took (many) pictures, and then, with Spider and Kebba by my side, and Pa and Cielianna blasting the horn, we began! The run was quiet and meditative at the start. I think we were all thinking about the great distance to come and what these starting steps mean as we begin this long and challenging journey. In the first village we passed through, Pa and Kebba made sure everyone was “awake” by blaring the horn through the sleepy town on Koina. WE were all excited and shouted “alumbara!” (good work to people working) and “Banjul calling!” as we ran through the first village. 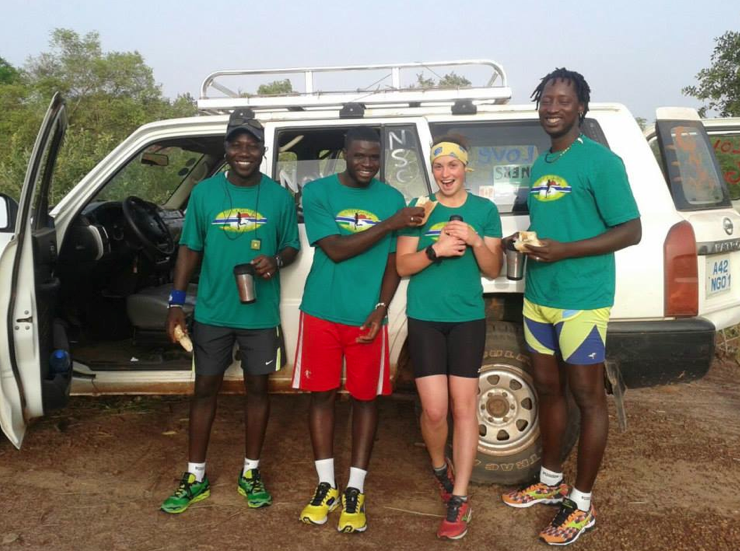 Most were in disbelief when they heard that we intended to reach Banjul by foot. As we continued, the team switched around who drove and who ran with me. Although I am normally a solitary runner, their company made each step so much easier and more meaningful. Today, I was lucky enough to always have someone (often many) by my side as I conquered the first leg. I started out feeling great (there was a ‘slight’ breeze), and, as per usual, a bit fast, but still comfortable. About 14km into the run, we came across our first school in which the NSGA works (town of Fatoto). The greeting was incredible. The entire school had lined up on both sides of the road and were singing a welcome song as we approached. This was a major goosebumps running moment for me. I really couldn’t believe it. After we passed, the entire school followed behind the team chanting and singing for the following kilometer. I got to meet the teachers and a few peer health educators as well, which was an amazing way to connect this run with the purpose of the funds being raised. As we continued on, I really began to notice the heat (40 degrees Celcius or more, unconfirmed). I slowed down a lot and attempted to think “happy thought” to get through the kilometers. Slowly but surely we reached the 20 km mark, which mean it was time to rehydrate, refuel, and rest before completing the rest of the days run. This was just what I needed – a forced rest to cool down and break up the run for the day. The team was in good spirits and we were able to cool down in a “slight breeze” under the shade of a giant tree. This was quite relaxing, and enough to make me feel ready to complete the days run – back to it! Banjul is calling! We begin again, and about a minute in I get a really painful stomach cramp – too much water and Gatorade while sitting is not doing well. I settle into a hunched over run/shuffle position and try to breathe slow – in for 4 steps, out for 4 steps; but its not helping. I try not to look at the km’s on the GPS watch too often so hopefully they will go by faster; this also doesn’t help. After about 3km, we begin to approach another village where the NSGA works and in the far distance I could see hundreds of children lined up on the side of the road. Alright, I think, I can push myself till we get there. When we got there, the greeting was unbelievable. We stopped to receive the welcome and were immediately surrounded. 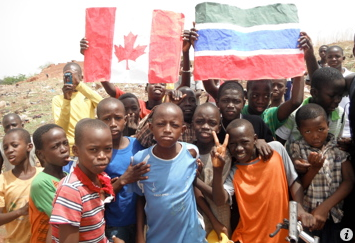 People had made signs with Gambian and Canadian flags, and there was even a sign saying “Go Jen, Go!”. It was absolutely incredible to meet so many people who are benefiting from the NSGA peer health education programs and to see how excited they are for the Love4Gambia run. We take (many) photos and shake many hands. We are invited to stay in their town, but say tha t we must continue to finish the last of the run. The last couple kilometers were relatively quiet. I kept thinking to myself, did that really just happen? Again, I’m blown away by the excitement and kindness of small Gambian villages, and feel so lucky to be able to run to support education programs for them. Soon enough, the first day is over. We all hug knowing that a large part of the journey is complete, but a huge space still rests between us and Banjul. 26km done, and only 398 to go! PS: Thank you to everyone for the thoughtful good luck and inspirational messages on the blog/facebook/twitter. They mean so much to me and the team (we were able to read a couple during the rest stop and the messages really touched all of our hearts). 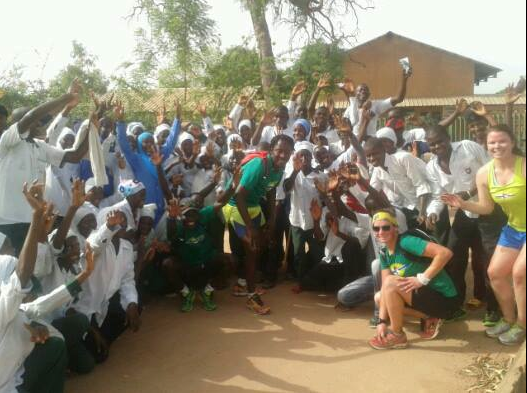 On behalf of Team Love4Gambia, I would like to dedicate today’s run to Luke and Aerobics First. Amongst other things, Luke made sure we all had new running shoes to begin our journey today, and will take us the rest of the way across Gambia. A big thank you from Team Love4Gambia to him! This entry was posted in Charity Run, Developing Country and tagged Day One, Fatoto, Jennifer Pasiciel, Kebby, Love4Gambia, NSGA, Pa Modou, Spidermanrunner. Bookmark the permalink. 2 Responses to Day #1: First Day Down, 16 More to Go! You are awesome…I love you and Cielianna so much…cant wait to join along…. What a great start Jen! Go go go! We’re sending cheers across the ocean! !